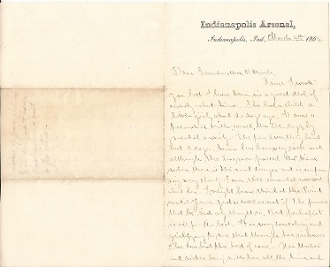 "...For the last nine days I have been occupied on a board for appraising certain ordnance stores belonging to the state of Indiana which the Governor (Gov. Martin) wishes to turn over to the U. States. When the war commenced several of the states armory then Ind. offered to make ammunition for the government and deliver it at cost, since the necessity has now passed and this is why the state wishes to close up the affair. I am nearly through with it and expect to close up today..."
Reinforced fold splits, otherwise fine. Rare imprint.